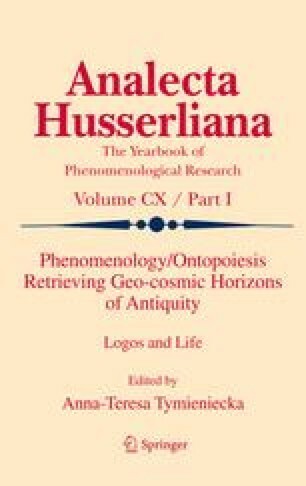 Consciousness’ contribution to the constitution of objects is a central concern for Husserlian phenomenology and its heirs. The philosophies of Levinas, Marion and Tymieniecka problematize this concern in the form of two commonly shared questions: “What is given in object-constituting consciousness?” and “How—if at all—is the given co-constituted by realities which transcend consciousness and are (in some sense) prior to it?” Though problematizing the issues similarly, the answers Levinas, Marion, and Tymieniecka give to these questions seem very different. For Levinas, the Other is given constitutively in all of its particularity in a relationless relation. Because it is outside of the totality of the Transcendental ego, it resists possession, is not an object of enjoyment but shows a freedom which is both a call to responsibility and to obligation. For Marion the phenomenology of givenness is tied to the kind of reduction accomplished: the reduction of the to-whom-given, the reduction of the to-which-given, the reduction of the how-given and the reduction of the how-far-given. For Marion it is the third kind of givenness—givenness as gift (Charity/Agapē) that delivers the Being of beings. For Tymieniecka, the New is poetically constituted in chaotic deconstruction and reconstruction of perceptual givens, after the incipient phase of awareness. In this paper, my intention is to argue that all three formulations of givenness, constitution and transcendence are complementary and tantamount to a rediscovery of three transcendental modes of being. For Levinas, it is the Other’s ingression into constitution of consciousness that points to the givenness of the Ethical (or the Good), for Marion it is Love that delivers Truth, and for Tymieniecka it is the New’s constitution out of given features of aisthēsis that points to the Beautiful. I will, further, suggest that each of these transcendentals may be understood theologically as Trinitarian appropriations belonging, respectively, to the Father, Son and Holy Spirit. Finally, I will also relate these different respective notions of givenness as descriptions of the Trinitarian personalization of revelation.